Building Information Modeling (BIM), is nowadays widely used to model and design buildings of all types and sizes. During earlier days, when BIM initially came in use, people had a misconception that it is suitable only for large complex structures and most of the early adopters of BIM concentrate on applying this technology on large complex projects. However, now BIM is started to apply widely in residential projects, which brings a significant change in the construction industry. The fact is that BIM for residential design can be adopted effectively for small firms too if we apply it with the right preparation and strategic planning. Selection of right BIM tool and its implementation through strategic planning of transitioning determines the success of BIM project. This planning is nothing but management. BIM can be defined as the combination of 3Ps, which are process, product, and practice. Here the process is a sum of building information and management, the product is BIM, which is the authoring tool (Revit, Bentley, etc.) and Practice means management that includes strategic planning of transitioning. 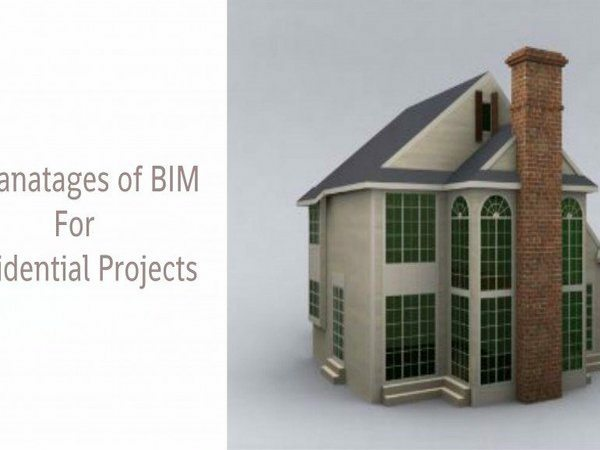 Experts believe that BIM is suitable for all types of the project of any scale and it can successfully solve the unique complications of each building sector with BIM in residential construction and BIM in residential architecture. That is why itself, several institutional projects around the world as well as residential developers began to accept BIM widely, realizing its benefits. Even though BIM was considered as a tool to improve the design process on large projects in earlier times, fortunately, that situation is changed now. The residential owners of this period realize that BIM, beyond a tool, is a method, which can be used throughout the practice for all types of projects of any size and design. As a result, BIM is begun to be used in more and more custom green homes projects. BIM enhances a collaborative effort of all members in a construction project including owners, architects, contractors, sub-contractors, engineers, suppliers, trade professionals and building operations/facilities personnel. So, the right information is accessible in the right place at the right time. Therefore, all projects of any type and size -from complex commercial building structures to small residential projects, get the benefit of BIM. The main feature of BIM 3D Modeling has a significant role in improving the business and so residential owners and developers depend on visual 3-D than the 2-D. Most of the client cannot understand the concept flat 2-D world. But developers can convince them easily using 3-D model. In short, using Building Information Modeling, we can view the project even before it is built. This technology also helps to avoid miscommunication, frustration, and waste. Increasing energy prices, unpredictable climate change, and occupant health consciousness are the matters of high concern around the globe nowadays. the high consumption of energy and carbon emission worldwide are the threats to our world about which the green evangelists are worried. So, the people all over the world are forced to take necessary actions to sustain the society green. As all these phenomena matter to residential, institutional and commercial building projects, the construction industry is under great pressure for changing the current design and construction approaches. Here comes the importance of BIM. As this new technology helps to reduce the waste and carbon emissions to the atmosphere, several construction firms in US and Canada start to adopt Revit, a BIM-authoring tool in the construction of residential architecture projects and custom green homes. In Canada, using Revit and ArchiCAD, some prefabricated homes plants started working. As well pipes are included in prefabricated floor panel using the MEP suite. As BIM improves the broad scale project ecosystem and enhances project outputs for all parties, it has growing implications in the construction industry. BIM can satisfy the unique workflow, expectations and values proposition of each player on a construction project, as it can be applied in every situation. Integrated Project Delivery (IPD), the result of BIM application, makes a significant change in the world of the construction industry. We all know that only big enterprises realized the usefulness of computers when it is introduced to the market first. But, now even small children are expert on the computer. Similarly, general contractors and sub-contractors as well as being increasingly used BIM to provide drawings and other disciplines in BIM. Both new projects and renovation projects start to apply BIM for a better result. Alyssa Milano December 26, 2015, at 6:07 am Reply Nice blog site created! I have found the blog site after huge searches through online. You have described the advantages of BIM and it is clearly understandable to all.